Snow is magical. More so when you have no concrete road or houses to tarnish its beauty miles away. And there is something about a snowy path which makes it so tempting for me to walk on. But I haven’t had the opportunity to visit many snow-covered places in the last 25 years of my life. I have always wanted to go to Iceland and enjoy an igloo stay with Aurora above me. And I promise. . . No matter which corner of the world I am currently in or how many months pass by before we meet again. . . Regardless of countless amazing people that I will meet in my life and life-changing experiences that I would undergo. . . No matter which country or city or village I am at the moment. . . I promise I will always come back to you. Whether you call me back or not, I will always find my way back to you. . . Because you don't abandon people and places that you care about. So, it felt extremely great when I got the chance to experience an Igloo Stay near Manali this February. Yes, it is no Iceland but come on, how awesome is it? To be surrounded by snow and live in an actual igloo at night? I’ll tell you, it is pretty amazing and you can experience this kickass igloo stay near Manali too! Now, a lot of you might know about HighMountains.in already but for those of you who don’t know, it is a travel company started by Aman Singh Gulati. He started this company a couple of years back and started organizing regular trips to Leh for huge batches. 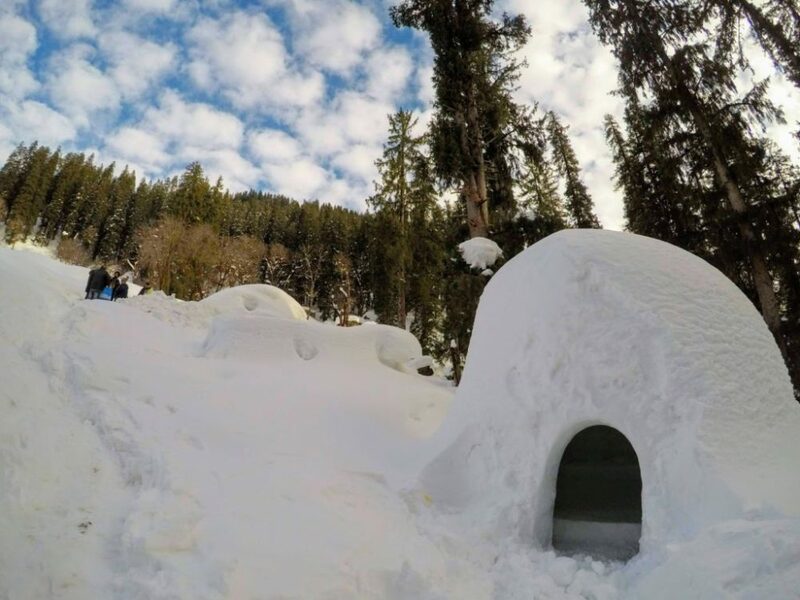 And now, they have decided to start an Igloo Stay, just 15 km from Manali where people can disconnect from the world for a while. So, if you want to experience an awesome Igloo Stay near Manali, then you can reach them out on their Instagram account. You can also Whatsapp them on +91 9888823721 for details on their packages. As I mentioned above, this Igloo Stay is near Manali so you will need to first reach Manali. Thankfully, there are a couple of options for you to choose from to reach here. The nearest airport to Manali is the Kullu airport which is located in Bhuntar. The airport is around 50 km from Manali and offers flight services to major destinations like Delhi, Chandigarh, etc. This is a great mode of transportation if you don’t have a lot of time and don’t mind spending a little extra to shorten your road journey. From the airport, you can reach the nearby bus stand which is just 11 km from the airport. From here, you will get buses to all the other cities and towns in Himachal Pradesh including Manali. Another option is to take a train to Kalka or Ambala Cantt. and then take a bus/cab from there. But remember that each of these railway stations has their own set of limitations. You can reach Ambala Cantt. but after that, you will need to take a bus which will easily take 5-7 hours to reach. If you choose Kalka railway station then you will need to carry on the remainder journey of 8-9 hours by a car or bus. The train will be cheaper but it will take longer for you to reach, not to forget the remaining road journey of 6-9 hours which you will have to manage via a bus/car. Finally, you have the option of taking a bus or your own car to reach Manali. Frankly, this is the best option for people who are reaching Manali from closer cities like Chandigarh, Delhi, Shimla, etc. You have both State and Private buses plying on this route to choose from. Ideally, a state ordinary bus from Delhi to Manali will cost you about 800 INR while a state Volvo bus will cost you about 1200-1500 INR. There are many private Volvos as well which will cost anywhere between 700 – 1000 INR. Buses will take about 14-15 hours and will be not as comfortable so choose your bus carefully. You can also choose to drive to Manali from Delhi (530 km), Chandigarh (310 km), etc. The roads are decent but will be slightly difficult to manage once you gain some elevation. So, make sure you good at driving in the hills before you go on a road trip to Manali. Once you have reached Manali, you will need to reach the Igloo site which is around 15 km from Manali, in the Panduropa village. There aren’t any buses plying through this route so you will need to take a taxi to reach here which will cost you about 3000 INR per trip. If you are driving your own car, you will have to get the required permit to enter this area. But thankfully, if you have booked your igloo experience with Highmountains.in then you don’t have to worry about all this. You have to simply reach their starting point and they will take you in their gypsy to the Igloo site. This 15 km stretch can take anywhere between 45 minutes to 1 hour to reach, more if the path is covered with snow. If there is fresh snowfall then you will have to stop 2-4 km before the Igloo Stay site and complete the remaining road on foot. Well, this should be a no-brainer. If you want to experience a proper Igloo Stay then the best time to visit is from December to March, provided it has snowed properly. Currently, the Igloo Stay is open till March (longer if the snow remains till March end). One thing to note is that ideally, a clear sky would be better for the Igloo Stay as you will be able to reach the site easily. If it snows, then you would end up walking which can be amazing too but you would need to have adequate boots and clothing. Plan your trip in such a way that you get to witness fresh snow and enjoy some games like snowboarding, skiing, etc. here. One of the most important things to remember when going for the Igloo stay is that there is no ATM in Panduropa. So, it would be a good idea to withdraw some cash from Manali before you head here. Also, once you are near Panduropa, your phone stops receiving a signal unless it is BSNL. So, be prepared to be disconnected for the duration you are here and inform your friends and family about it. When you are planning for your Igloo Stay trip, it would be better to spend a night at Manali before heading to Panduropa. This will give you time to freshen up and prepare yourself for the cold and you can also buy warm clothes, gloves, socks, etc. if needed. 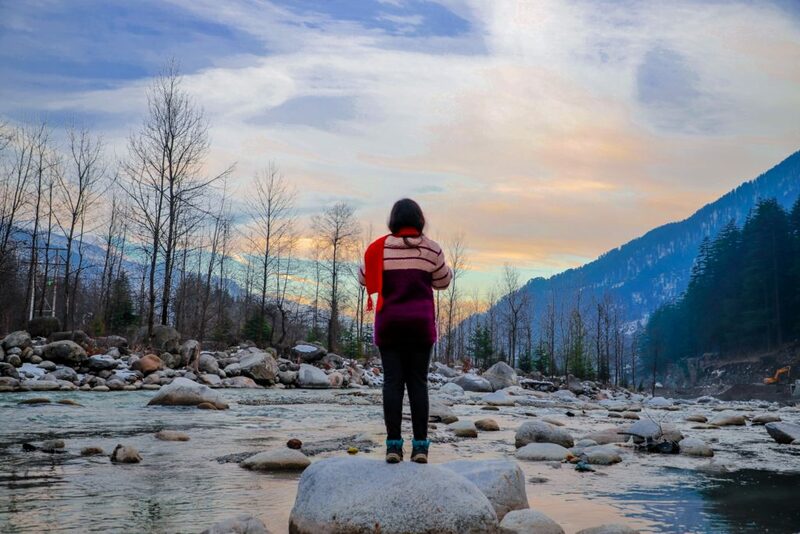 In Manali, there are several good hotel and backpacker options here for you to consider which will cost somewhere around 500 – 1000 INR per night per person. We stayed in Hotel Mountain Trail which offered an amazing view of the entire town and had the perfect sunrise view from our balcony. We were there for around 4-5 days and this is a sample itinerary that you can follow to enjoy your time here too. I reached Manali in the morning around 10 a.m. after leaving from Delhi at 7.30 p.m. the night before. After reaching Manali, I made my way to the Hotel Mountain Trail where we got refreshed and has an amazing breakfast while observing the snow-covered mountains. In the afternoon, around 3 p.m., we left to explore the Mall Road and had a delicious Pizza at one of the restaurants here. Then, we headed out to the small forest park and made our way to the river bank. From here, you can watch a gorgeous sunset and the colors look completely unreal. After that, we headed back to our hotel and enjoyed a nice bonfire at night. We were supposed to leave for the Igloo stay today and spend a night there but due to snowfall the previous nights, we had to change the plan. So, we went for a day tour to the Igloo site instead. We left around 12 p.m. for Panduropa and had to park around 2 km before the site due to snow-covered road. Then, we walked for the next hour to reach the Igloo Stay site. On the way, we came across tall trees which flanked both the sides of the road. And the view from the edge was really gorgeous as we could see the valley clearly in front of us. We stopped a lot on our way to click pictures and enjoy the walk. We finally reached the site at around 4 p.m. and explored the area a bit. There was also a dining room there where we enjoyed some snacks and drinks. After that, we learned about the process of Igloo making and how much time it takes for an igloo to completed. We also climbed on the Igloos and jumped from it, trust me that was a lot of fun! Then, around 5 p.m., we started heading back to our car and enjoyed a delicious Rice Meat meal at the last food shop here. Then, we made our way back to Manali and rested in our hotel for the night. On our third day, the snow had been cleared from the road so it was time to stay in the Igloo now. We took a daypack with us with our essentials and started for the Igloo Stay around 12 p.m.
We reached the site without needing to walk and then stored our bags inside the Igloo and explored a little. As it was a cloudy day, we didn’t go far and just enjoyed our site. We spent some time in the kitchen as it was warm and cozy. Around 7-8 p.m., we started our bonfire party here and sat around a big bonfire which kept us warm in the cold night. We laughed and talked and exchanged our stories while eating delicious BBQed food. After a while, we headed back to the kitchen to enjoy our simple yet delicious dinner. And then we headed to our Igloo for sleeping. Honestly, I expected it to be cold but with 2 layers of styrofoam, a sleeping bag, and a liner, it was quite warm and cozy. Next day, we got up around 9 a.m. and enjoy a light breakfast. After that, we made our way to the nearby dam which offers the most gorgeous valley views. We spent some time here, taking photographs and snowboarding and then when it started to snowfall, we made our way back to the Igloo site. In the afternoon, we started packing up to go back to Manali as we had a 5.30 p.m. bus to catch for Delhi. There are 3 types of packages offered by this Igloo Stay company: Day Tour, 1 Night 2 Day Package, and 2 Night 3 Day Package. Essentially, it is a Manali to Manali package so you will need to reach Manali on your own. From Manali, they will take you to the Igloo Stay site as per your package. There are activities also offered here like snowboarding, tire sliding, etc. And if you stay for the night, then you can expect a delicious BBQ along with a bonfire. They also provide you with warm and cozy sleeping bags, boots, etc. so that you don’t feel cold when going to the Igloo site. Honestly, this was my first experience of staying in an Igloo and spending so much time in the snow. And it was undoubtedly amazing. This Igloo Stay company was really organized and helpful and took care of any problems that we faced. I mean, this is the first time that I have had such a smooth experience with a travel company so it was a good change.